Markets move in cycles. Periods of easy trading are followed by periods of difficult trading and vice versa. Unfortunately most impatient traders expect the good times to roll forever and the bad times to never stop. But that of course never happens. The world is constantly changing and markets are no different. After a very difficult bear market metals transitioned into a very profitable baby bull. Most traders missed it or missed most of it because the bear had conditioned people to expect only bad things from precious metals. Once everyone had recognized the baby bull it became time for more difficulties. Now again most people have become convinced that metals are never going to amount to anything. But after hard times come good times and I think the metals are about to leave many at the station again just like they did during the baby bull. We just need to get through a final whipsawing stage as we wait for the Fed to raise rates again at the June meeting. This entry was posted in Uncategorized on May 31, 2018 by Gary. 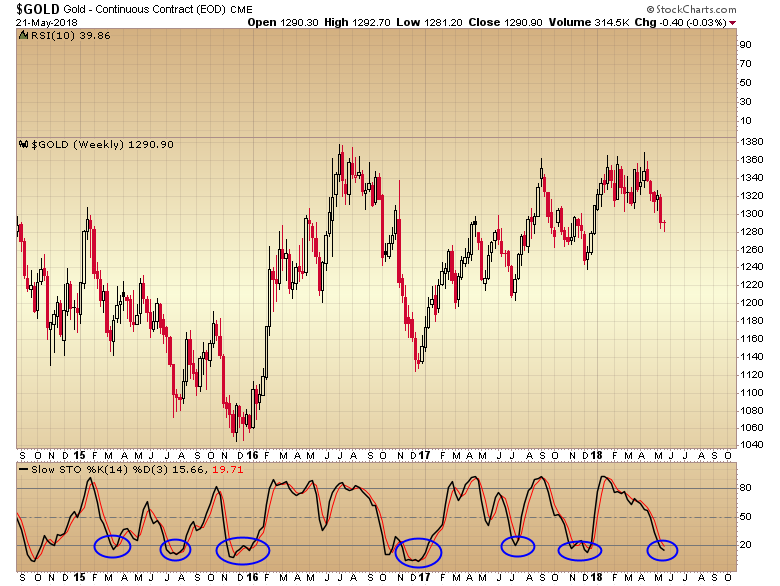 I’m going to go out on a limb and say last Monday was the intermediate cycle low for gold. But, I suspect the sector is going to experience a lot of whipsawing between now and the FOMC meeting. The strong trending move I’m looking for is most likely going to start after the Fed meeting, but I do think last weeks low is going to hold. This entry was posted in Uncategorized on May 30, 2018 by Gary. It’s possible gold finished its intermediate cycle low last Monday, but it’s also in the cards that the low will come on, or close to the FOMC meeting on June 13. The currencies have had a tendency to reverse on the rate hikes, and once the dollar turns back down it should release gold to begin what I think will be the breakout from this long and frustrating basing pattern over the last year and a half. If we do still have 2 more weeks before the final bottom then this is the period where dumb money will panic and sell. It’s inevitable and happens at every single ICL. Let’s face it, dumb money has to consistently lose in order for smart money to consistently profit. If gold turns back down next week are you going to behave like dumb money and panic, or will you see it as an opportunity forming. 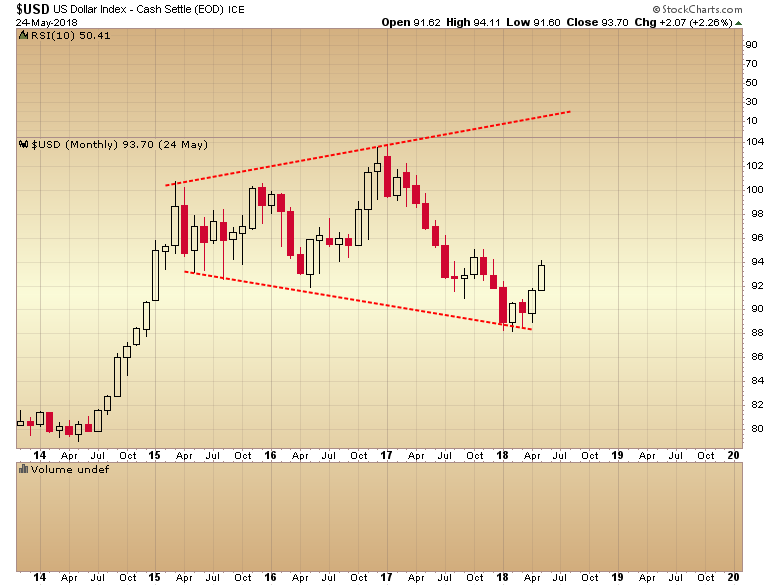 ICL’s are the single best buying opportunity of the year. They usually only occur twice. Dumb money never see them as opportunities. They are too busy selling at the bottom. The last really great opportunity like this came in December of 2016. So many people panicked and sold or cancelled right before the metals took off. The SMT metal portfolio has gone from +50% to +369% since then. With the benefit of hindsight we can now see that was the mistake of the decade. Are you going to make that same mistake again right as the next great opportunity arrives? This entry was posted in Uncategorized on May 26, 2018 by Gary. This entry was posted in Uncategorized on May 25, 2018 by Gary. 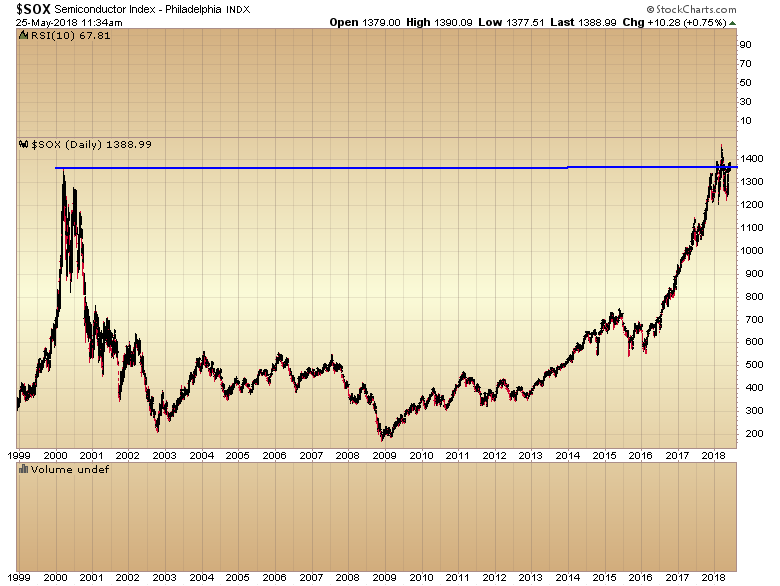 The leading sector is still consolidating around the 2000 high of 1362. It’s above that level today and while I’m not sure it’s quite ready to produce a sustained breakout just yet, once it does, a basing pattern this huge should drive at least a 10-15 year rally. This is what ICL’s do, they convince everyone there will always be another leg down. Then if that happens to play out everyone will start looking for another leg down after that. This is why most traders miss these ICL turns. It’s why I place cycles so high on my list of tools. When price is in the timing band for an ICL and sentiment is excessive I stop looking for another leg down and start looking for a bottom. I have to admit some of you are starting to learn. Fewer people are panicking and selling at the bottom. Fewer people are becoming frustrated and cancelling their subscriptions right before we start making money on the next intermediate rally. Of course some people are just hopeless and will forever trade with their emotions. These people are destined to always buy high and sell low. But more and more of you are starting to see the light. You are drifting away from the retail day trader/gambler mentality and moving towards longer term position trades. Timing perfect entries is becoming less important. Many are now able to recognize when something is “close enough” and you aren’t panicking if price doesn’t immediately go in your favor the second you enter a trade. Many are starting to learn if it’s late in a daily cycle you don’t have to make a perfect entry to make money. You just have to wait until the cycle turns. Congratulations you are now on the road to leaving the dumb money camp and graduating to smart money traders. This entry was posted in Uncategorized on May 24, 2018 by Gary. 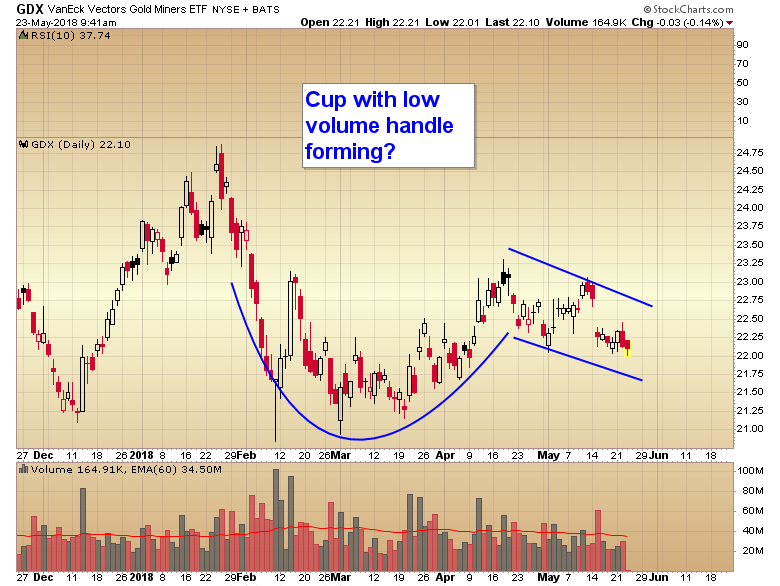 Notice that the miners haven’t followed gold to lower lows during this intermediate decline. When was the last time miners didn’t get obliterated during an ICL? This entry was posted in Uncategorized on May 23, 2018 by Gary. Without fail dumb money just repeats the same mistakes over and over. At bottoms their emotions convince them that price can never go up, so they sell. At tops their emotions convince them that price can never go down, so they buy. At bottoms people cancel their subscription because they get frustrated or the move doesn’t happen quick enough for them. At tops I see huge inflows of new subscribers after the move has already happened and it’s too late. Seriously people the time to buy, and or buy a subscription to the SMT is when the weekly charts are oversold, not when they are overbought. Short of beating people over the head with a hammer what must I do to change your behavior? How many times must you make this same mistake over and over before you learn and move into the smart money category? This entry was posted in Uncategorized on May 22, 2018 by Gary. Now that the small caps have broken out to new all time highs there’s no longer any doubt at all that the perma bears got it wrong again. We are in a long term bull market and currently in a consolidation after the big run post election. The Nasdaq might make higher highs as well but I don’t think we are quite ready for the entire market to deliver a big sustained move just yet. My guess is it won’t be until after the next rate hike before a sustained breakout can begin. I’m still seeing people calling for a market crash due to rising interest rates. Apparently these people don’t have time to study history. Markets always rise during the initial phase of a rate hiking cycle. Maybe once rates reach 5-7% we might have to become concerned, but not at 3%. If you’re still listening to an analyst telling you to short the market, run far and fast in the other direction. The proper strategy in a bull market is to buy dips not sell short. This entry was posted in Uncategorized on May 17, 2018 by Gary. 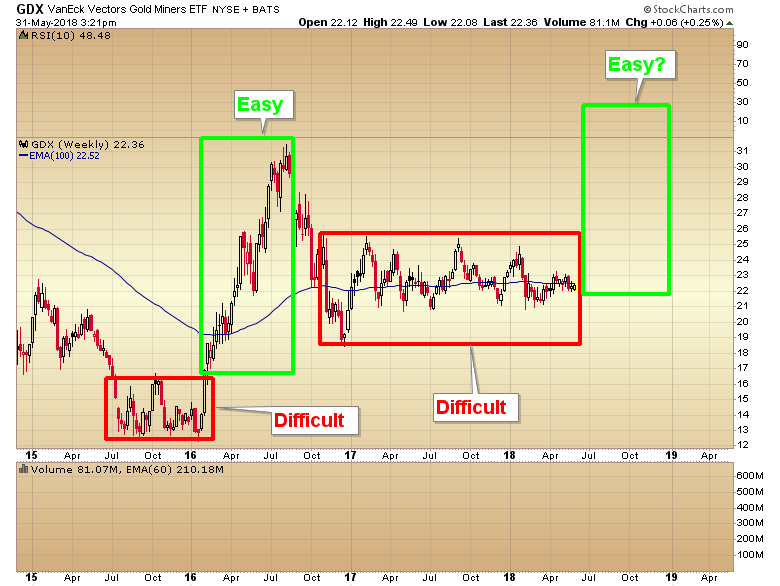 When was the last time we saw miners holding up this well during an intermediate degree decline in gold? GDX is only down 4% from it’s recent high despite gold breaking below $1300. Gold is down over 5%. The miners are down less than gold during an ICL. This entry was posted in Uncategorized on May 16, 2018 by Gary.